After signing our earnest money contract with our home builder for our lot, our first order of business was to choose the home's exterior finishes. This selection is to be completed within the first week of signing, which is SO QUICK. We went in assuming this Texas home builder wouldn't have the color scheme we wanted, so we just figured we would settle on something that was neutral in color, if anything. We picked our stone quickly. It's called Blanco, in the sawn chop style. It's the lightest stone they offer with the least amount of variance between stones. Easy peasy. For brick, our qualifiers were no reds, no pinks, no oranges. That left us with the browns for brick. Everything we saw in the neighrhood was the wrong color, or brown...nothing light or gray like we hoped for. After looking at the current homes in the area for color palettes, we headed back to the model home to view more homes in their database for color selections. Much to my surprise, I found a single example of a home with the Blanco stone AND a light brick the builder had paired for a home across town! Seeing that in their portfolio made me ecstatic. (photo below of the house we found in the database from our builder) The brick is called Silverado, and if I had only seen the sample in person I would have passed on it. It's so boring! However, paired with the Blanco stone, and our paint selection, it's looking more and more like we had envisioned! Let me add something for clarity. The photo above is only representative our our finish selections, and looks nothing like our home. Ours will have a much smaller front elevation and is a one-story. We are really looking forward to having a one story with kids in the house! Enter our amazing sales rep. She made all the right calls and talked to the right people, and somehow made it happen for us! 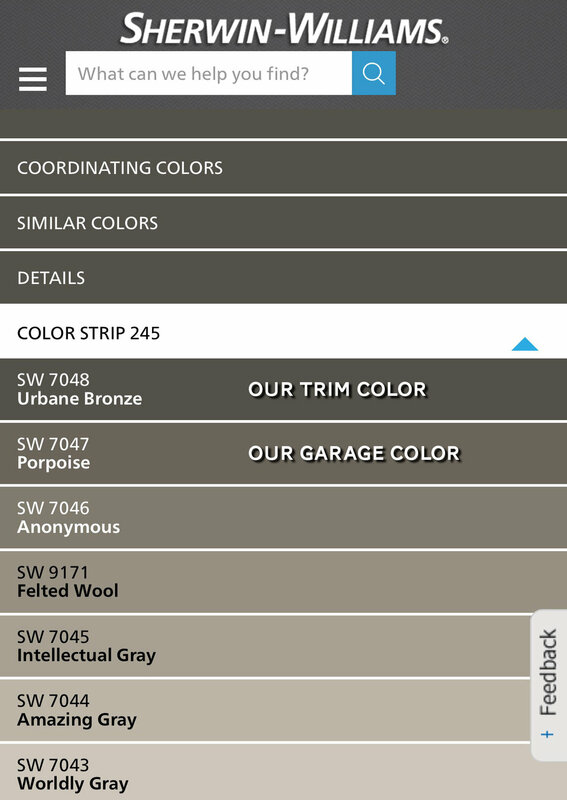 We will be having Sherwin Williams Urbane Bronze as the trim, and SW Porpoise as the garage doors. Below is the closest photo I have to our final finishes. The brick and stone are ours, but those paint swatches were the "darkest" they had previously tried to get us signed up for. Just imagine all that, but with the darker shades shown on the color strip below. Cliffnotes version: stick to your guns, and explore everything when working with a production builder. You'll never know unless you ask, and I'm realizing just by being brave (obnoxious?) enough to ask, we've been given more freedom with our customizations!